Satellite Radio, Onboard Communications System, Back-Up Camera, TRANSMISSION, 8-SPEED AUTOMATIC, AUDIO SYSTEM, CHEVROLET MYLINK RADIO. ENGINE, 2.0L TURBO, 4-CYLINDER, SIDI. Turbo, TECHNOLOGY PACKAGE, RS PACKAGE. RS PACKAGE includes (RQ9) 20 5-split spoke premium Gray-painted, machined-face aluminum wheels, (T4F) high intensity discharge headlamps, LED taillamps, RS-specific grilles and (D80) decklid-mounted lip spoiler, TECHNOLOGY PACKAGE includes (IO5) Chevrolet MyLink Radio and (UQA) Bose premium 9-speaker system, CHEVROLET MYLINK RADIO WITH 8 DIAGONAL COLOR TOUCH-SCREEN, AM/FM STEREO WITH SEEK-AND-SCAN AND DIGITAL CLOCK includes Bluetooth streaming audio for music and select phones; voice-activated technology for radio and phone; featuring Android Auto and Apple CarPlay capability for compatible phone and Shop with the ability to browse, select and install apps to your vehicle. Apps include Pandora, iHeartRadio, The Weather Channel and more, ENGINE, SIDI, VVT (275 hp [205 kW] @ 5600 rpm, 295 lb-ft of torque [398.3 N-m] @ 3000-4500 rpm) (STD), 8-SPEED AUTOMATIC includes transmission oil cooler and (BTV) remote vehicle starter system (STD). 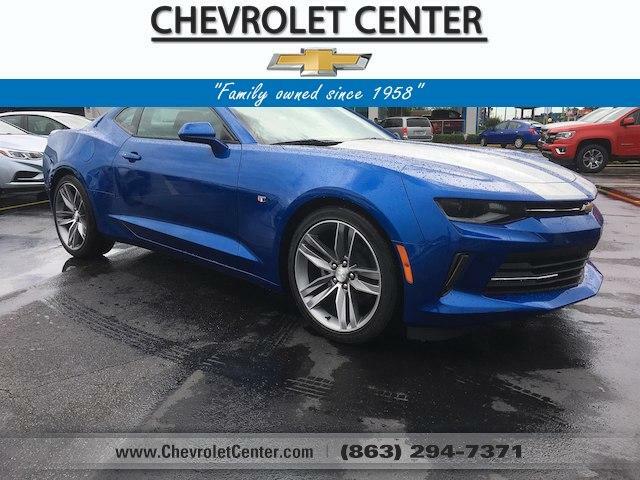 Edmunds.com explains We also like the 2018 Camaro's precise handling, smooth ride on the highway and plenty of standard equipment for the money. If you haven't been around a Camaro in a long time, you'll likely be shocked how refined the latest version is..